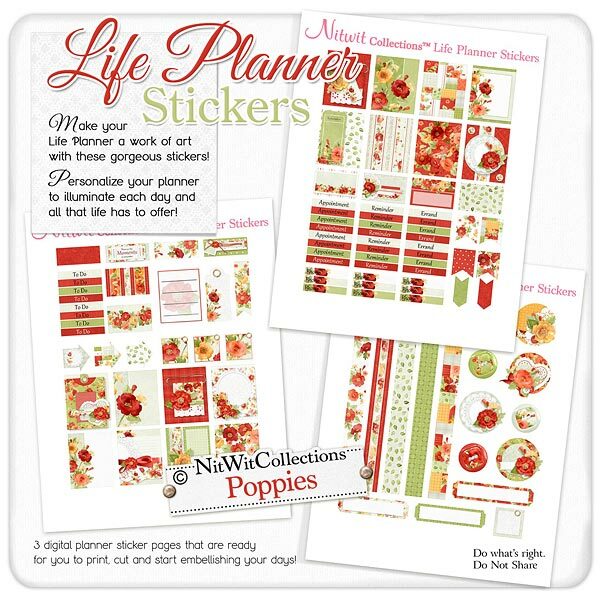 "Poppies" Life Planner Stickers glow and bloom with beauty! The colours, textures and options that this digital sticker kit provides will delight your senses and creative life planner page ideas. Take it all in and then let your imagination "grow"...the opportunties are endless! 2 - Arrow elements - possibly you want to use these to highlight an event, day or appointment that you just can't miss!! 3 - Arrow elements to play with...what's their best possible use in your eyes?? 1 - Clip tag with the flowers on the left side and a metal like grommet at the top...wouldn't you love this tag clipped to your planner as a name tag or bookmark?? 1 - Floral strip - should you attach this to a paper clip for a bookmark, or do you see it decorating a vertical part of your page?? 3 - Button elements...how cute are these!! 5 - Circular planner page elements that are here to embellish your life planner pages to the hilt! Florals, lace-like elements and spaces to write on them...let creativity be your guide!